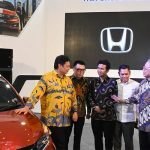 SURABAYA– Minister of Industry Airlangga Hartarto opened the GAIKINDO Indonesia International Auto Show 2019 (GIIAS) in Surabaya 2019. Minister Ailangga Hartarto was accompanied by Deputy Governor of East Java Emil Elestianto Dardak, Chairaman of the Association of Indonesian Automotive Industries (GAKINDO) Yohannes Nangoi, and Chair III of GAIKINDO who also the Chair of the 2019 GIIAS Organizer Rizwan Alamsjah. GIIAS Surabaya 2019 runs from 29 March to 7 April 2019. The target is 50 thousand visitors and sales of 2,500 units. Last year, GIIAS Surabaya 2018 saw transaction of 2,200 units. The car exhibition in Surabaya is one of GIIAS’s largest autotive exhibition series throughout 2019. Apart from being held in Surabaya, the 2019 GIIAS series will also take place in Jakarta (precisely in BSD Tangerang, Banten), Makassar (South Sulawesi), and Medan (North Sumatra). The automotive industry, according to Airlangga during his address, is one of Indonesia’s 4.0 mainstay sectors. “And between exports and imports, the industry generates foreign exchange for the country,” said Airlangga in his opening remarks at GIIAS Surabaya 2019 at Grand City Mall, Friday, 29 March 2019. The Minister of Industry also said that the number of four-wheeled vehicle sales during 2018 was 1.3 million vehicles, or worth USD 13.7 billion. While the number of exports reached 346 thousand units, equivalent to USD 4.78 billion. He said that the automotive industry will increasingly become more competitive, given that local content is increasing. Increasing local content is the key to success of the automotive industry to become a manufacturing base in ASEAN and even in Asia. “The Ministry of Industry encourages the industry that we call Low Carbon Emission Veichle (LCGC) with three programs, namely with energy-efficient vehicles, the affordable LCGC prices must be under IDR 200 million, which is the majority of sales here. Then electric vehicles and flexy engine,” said Airlangga. In the future, the Indonesian government needs to encourage the effort to promote the flexy engine. Because the government can produce fuel oil (BBM) from the basic ingredients of vegetable oil (biofuel) from palm oil (crude palm oil, CPO) which is now a conversation between the government of Indonesia and the European Union (EU). The European community prohibits fuel made from palm oil (vegetable, not mineral or mining). “The European Union is unfair. The Indonesian government is currently reviewing further steps than this unfair trick,” Airlangga explained. The government is increasing the production of solar biofuel from “Bio 20” (meaning 20 percent of the content of palm oil, with an 80 percent mixture of mineral oil) into “Bio 100” (ie diesel fuel with a total of 100 percent produced from palm oil, not mixed with mineral oil).